In complex congenital heart disease (CHD), it is important to know the differential lung perfusion because asymmetrical lung perfusion is one of the predictors of the outcome and exercise capacity. Quantitative lung perfusion scintigraphy (LPS) is considered the gold standard for quantitative evaluation of pulmonary perfusion in most patients with CHD. , The indications for quantitative LPS in patients with CHD may be classified as pre- and post-surgical and/or percutaneous intervention. Quantitative LPS studies are simple to perform. No specific patient preparation is necessary. Technetium-99m ( 99 Tc) macroaggregated albumin (MAA) is the radiopharmaceutical used. The recommended dose of 99m TC is 37-148 MBq (1-4 mCi). With the aid of computer software, region of interests (ROIs) are placed over the right and left lung and the geometric mean of the anterior and posterior counts in each region is calculated. Each lung can be further divided into thirds to create superior, middle and inferior ROIs. This division does not correlate with anatomic division into lobes. Patients with CHD with normal pulmonary artery have normal perfusion with essentially equal perfusion to both lungs [[Figure 1]a and b]. In the anterior view, cardiac silhouette and aortic knob are commonly identified. Commonly, a cardiac silhouette larger than expected from chest radiograph may be produced by hypermobility of the heart when lateral images are obtained. 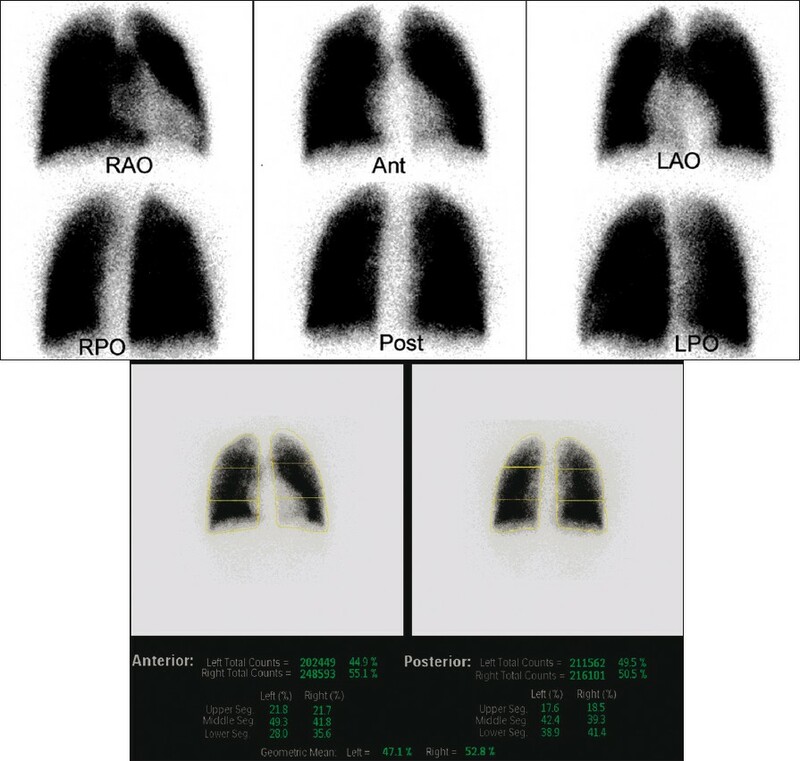 Perfusion lung scan should be correlated with chest X-ray for accurate evaluation of cardiac size. A rare but potential pitfall in the interpretation of perfusion lung scan in CHD patients with symmetrical bilateral pulmonary artery stenosis may have symmetrical relative perfusion in both lungs. 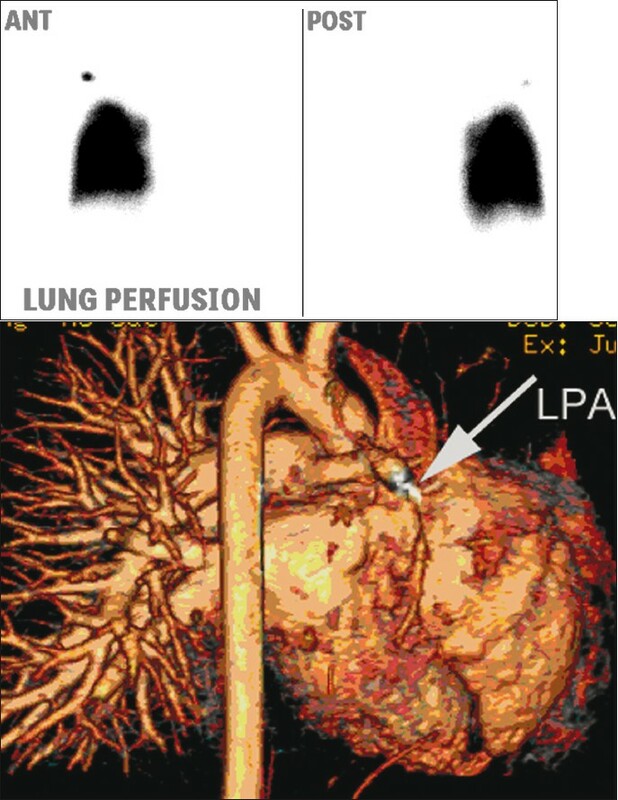 Unilateral absence of lung perfusion is seen in patients with congenital absence of pulmonary artery, wherein the ipsilateral lung perfusion occurs through collaterals from bronchial arteries that cannot be assessed by lung perfusion except in patients with functioning right to left shunt. In addition, unilateral absence of pulmonary artery perfusion is seen in many CHD patients, such as patients with Tetralogy of Fallot TOF and absent right or [[Figure 2]a and b] left pulmonary artery. Other differential diagnoses of unilateral absence of lung perfusion include pulmonary aplasia (absence of ipsilateral pulmonary artery, absence of ipsilateral pulmonary tissue and bronchus terminates in dilated blind pouch), pulmonary embolism [[Figure 3]a and b] and hyperlucent lung syndrome. Unilateral decreased relative lung perfusion is the most common perfusion abnormality seen in patients with CHD. The etiology of unilateral decreased lung perfusion can be divided into an isolated congenital branch PA stenosis and branch pulmonary artery (PA) stenosis seen in many CHD patients, such as TOF with right or left PA stenosis, transposition of the great arteries (s/p arterial switch operation) and truncus arteriosus. Quantitative LPS studies may be used before the surgery or intervention to assess the severity of the stenosis. Post-intervention LPS is used for follow-up [[Figure 4]a and b]. Where there is a right to left shunt, some of the MAA escape from the pulmonary circulation and lodge in the systemic capillaries. By estimating the counts in the lungs and in the systemic circulation, it is possible, after an intravenous injection of MAA, to estimate the size of the right to left shunt [[Figure 5] a and b]. Presence of aortopulmonary collaterals blood vessels (APCs) may cause significant systemic to pulmonary shunt. APCs are associated with a variety of CHD (TOF and pulmonary atresia). Right to left shunt may occur in many types of CHD with elevated right ventricular pressure, such as TOF, transposition of great arteries, truncus arteriosus and ebstein anomaly. Differential diagnosis of abnormal right to left shunt includes hepatic cirrhosis and pulmonary arteriovenous malformation. Thrombosis and thromoboembolism can be a significant cause of morbidity and mortality after Fontan operation [Figure 6]. The possible risk factors that may contribute to thrombosis in patients with CHD include low flow state, stasis in venous pathways, right to left shunt, blind cul de sacs, prosthetic materials and/or arrhythmias. It has been demonstrated that the prevalence of silent pulmonary embolism in adult Fontan patients is 17%; initial screening was performed with ventilation perfusion lung san and, subsequently, was confirmed with computed tomography (CT) pulmonary angiogram. 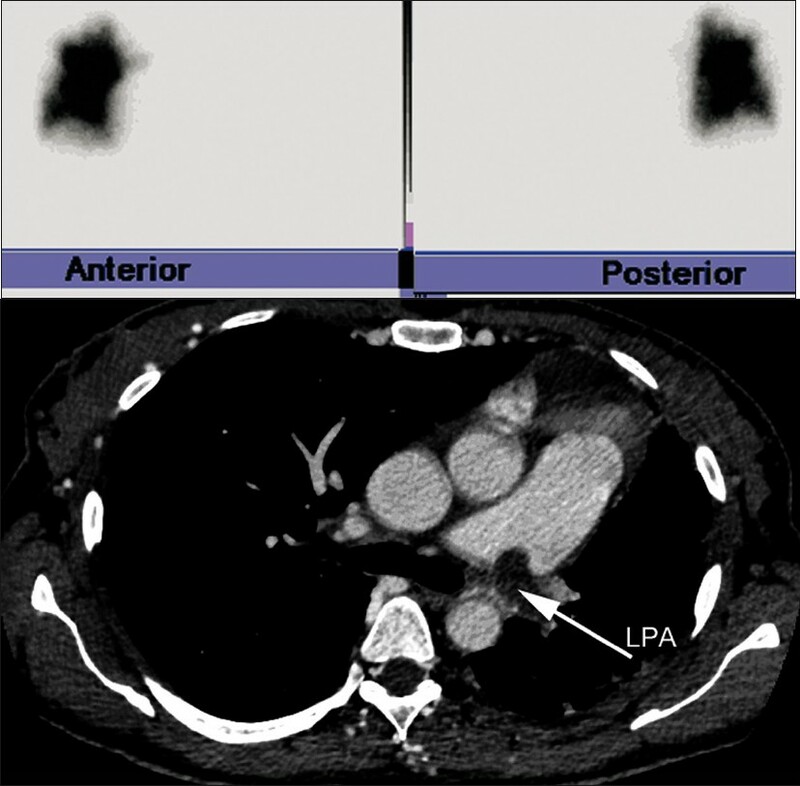 Although LPS was performed without a ventilation scan, findings of multiple segmental perfusion defects should raise the possibility of pulmonary embolism and further investigation such as CT pulmonary angiogram must be considered. Magnetic resonance (MR) imaging is now increasing in the assessment of CHD in both children and adults. Quantitative blood flow has been measured using phase-contrast magnetic resonance (PC-MR). PC-MR has shown to be accurate in adult patients where pulmonary artery is often normal. Recent studies have demonstrated that PC-MR is able to assess both anatomic and quantitative information in patients with CHD with complex pulmonary artery anatomy and regurgitation. The main advantage of MR is that it avoids ionizing radiation and comprehensive examination of anatomy, morphology and flow quantification in one exam. The limitations to MR are several, which include: (1) absolute contraindications as in the case of pacemaker, (2) the need for general anesthesia and (3) several potential errors, such as incorrect prescription for location or angle, incorrect technical parameters and signal dephasing owing to turbulent flow in case of discrete stenosis. It is important to measure the differential lung perfusion in patients with CHD as it predicts the outcome and exercise capacity. Quantitative LPS is simple, safe and widely available. Several patterns of LPS are seen in patients with CHD. Knowledge of different patterns, potential pitfalls and limitations are very important to avid false interpretation with subsequent patient mismanagement. PC-MR imaging may be considered as an alternative test in some patients. 1. Rhodes J, Dave A, Pulling MC, Geggel RL, Marx GR, Fulton DR, et al. Effect of pulmonary artery stenoses on the cardiopulmonary response to exercise following repair of tetralogy of Fallot. Am J Cardiol 1998;81:1217-9. 2. Tamir A, Melloul M, Berant M, Horev G, Lubin E, Blieden LC, et al. Lung perfusion scans in patients with congenital heart defects. J Am Coll Cardiol 1992;19:383-8. 3. Pruckmayer M, Zacherl S, Salzer-Muhar U, Schlemmer M, Leitha T. Scintigraphic assessment of pulmonary and whole-body blood flow patterns after surgical intervention in congenital heart disease. J Nucl Med 1999;40:1477-83. 4. Parker JA, Coleman RE, Hilson AJW, Royal HD, Siegel BA, Sostman HD. Society of Nuclear Medicine Procedure Guideline for Lung Scintigraphy. Version 3.0, approved February 7, 2004. Available at: http://interactive.snm.org/docs/Lung%20Scintigraphy_v3.0.pdf. [accessed on 2009 January 21]. 5. White RI Jr, James AE Jr, Wagner HN Jr. 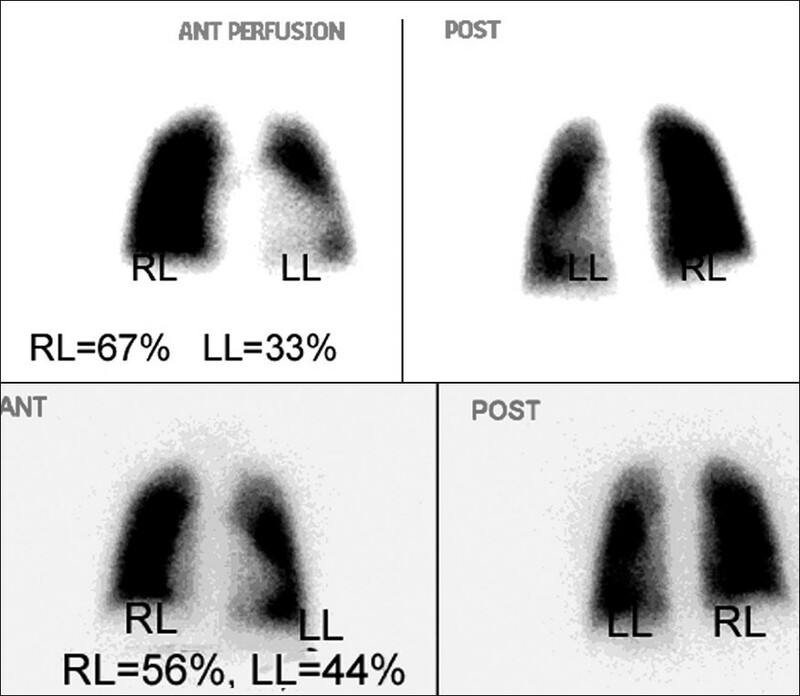 The significance of unilateral absence of pulmonary artery perfusion by lung scanning. AJR 1971;111:501-9. 6. O'Laughlin MP, Slack MC, Grifka RG, Perry SB, Lock JE, Mullins CE. Implantation and intermediate follow-up of stents in congenital heart disease. Circulation1993;88:605-14. 7. Sommer RJ, Hijazi ZM, Rhodes JF Jr. Pathophysiology of congenital heart disease in the adult: Part I: Shunt lesions. Circulation 2008;117:1090-9. 8. McElhinney DB, Reddy VM, Tworetzky W, Petrossian E, Hanley FL, Moore P. Incidence and implications of systemic to pulmonary collaterals after bidirectional cavopulmonary anastomosis. Ann Thorac Surg 2000;69:1222-8. 9. Varma C, Warr MR, Hendler AL, Paul NS, Webb GD, Therrien J. Prevalence of''silent'' pulmonary emboli in adults after Fontan operation. J AmColl Cardiol 2003;41:2252-8. 10. Fratz S, Hess J, Schwaiger M, Martinoff S, Stern HC. Accurate Quantification of Pulmonary Blood Flow by Magnetic Resonance Imaging Than by Lung Perfusion Scintigraphy in Patients With Fontan Circulation. Circulation 2002;106:1510-3. 11. Wu MT, Huang YL, Hsieh KS, Huang JT, Peng NJ, Pan JY, et al. Influence of Pulmonary Regurgitation Inequality on Differential Perfusion of the Lungs in Tetralogy of Fallot After Repair: A Phase-Contrast Magnetic Resonance Imaging and Perfusion Scintigraphy Study. J Am Coll Cardiol 2007;49:1880-6. 12. Valente AM, Powell AJ. Clinical applications of cardiovascular magnetic resonance in congenital heart disease. Cardiol Clin 2007;25:97-110.